While you may not "appreciate" all the flavors inside the Jelly Belly Bean Boozled Advent Calendar, this US treat is a holiday must-have! Use it as a stocking stuffer, trick your kids with it, or have a huge laugh at a holiday party. 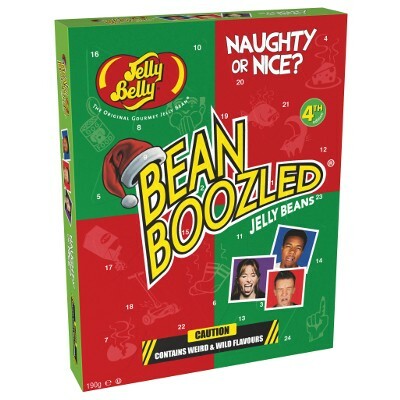 This naughty or nice box of Jelly Belly Bean Boozled jelly beans will keep you in suspense with flavors like berry blue, buttered popcorn, booger and many more! Sugar, glucose syrup, modified cornstarch, flavorings, concentrates of (apple, pumpkin, carrot, spirulina, black currant, hibiscus), salt, colors (E100, E150a, E153, E162, E171), acidity regulators (E270, E325, E327, E330, E331), glazing agents (E901, E903, E904), puree (peach concentrate, banana), chocolate (sugar, cocoa mass, cocoa butter, emulsifier: E322 soy, flavoring), juice concentrate (lime, pear), cocoa powder, coconut, thickener (E1400), vinegar. Nutrition facts (for 100g): calories 364Kcal, total fat 0g (saturated fat 0g), total carbohydrate 91g (sugar 62g), protein 0g, salt 0.12g.